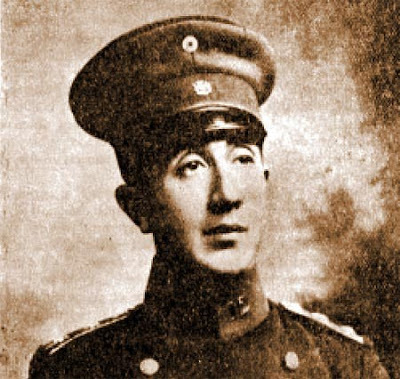 According to history, the Chilean Lieutenant. Alejandro Bello Silva disappeared with his airplane on March 9, 1914 while he was flying during a test of flight, Nobody knew what happened to him because they couldn’t find his remains or his biplane. His disappearance is quite similar to the cases of Amelia Earhart and Antoine de Saint Exupery who were also aviators, but contrarily to them Bello was not abducted by aliens. WHAT HAPPENED TO LIEUTENANT BELLO? Interlocutor: Master, I’d like to continue with another case, which is quite mysterious, it is related to the disappearance of a Chilean aviator in 1914, and I’m talking about Lieutenant Bello. Ruanel: The Lieutenant Bello didn't crash the plane and he didn’t get lost either, he simply disappeared through a dimensional portal. Interlocutor: And Did he disembody? Ruanel: No, he didn’t disembody. He went to another world. Interlocutor: To the past or the future? Ruanel: Neither to the past nor the future, he simply went to another world in the same time. Ruanel: On the planet Earth there are dimensional portals like worm holes and one can go to other worlds through them. They are vortexes and there are infinity of them. In addition, any person that investigates can realize that if an airplane went for example from Santiago to Arequipa, disappearing at some a distance between these points, the remains should be unquestionably in a certain place, and they didn’t find them. Interlocutor: They have to think that he disappeared through some dimensional portal. Ruanel: Obviously. Airplanes don't disappear in the air. Interlocutor: What did lieutenant Bello found when he passed through that dimensional door? Ruanel: He simply found himself in a world of his same time, which is at 300 light years whose inhabitants control dimensional portals to pass to other worlds. Interlocutor: Did lieutenant Bello pass through this dimensional door accidentally or was he attracted or abducted somehow? Ruanel: He passed by chance. Interlocutor: Did he land on that planet? Interlocutor: What kind of inhabitants did he meet? Ruanel: With Homo Sapiens Sapiens, very similar to terrestrials. Interlocutor: Did they receive him well? Ruanel: Yes, because they are advanced, very peaceful beings. Interlocutor: Do they have space ships? Ruanel: No, they directly control dimensional doors only. Interlocutor: Why didn't they allow him to return? Was there some kind of problem? Ruanel: No, they could have returned him easily, but they knew that he would speak and they considered that it was not convenient that Earth knows about them. Ruanel: What I mean is the following thing: On Earth the dimensional doors are invisible, they are like energy hoops, but in that world the doors are visible and they have shapes. Ruanel: Yes, they have shapes because they have locked them in shapes of energy hoops, which are controlled by artifacts similar to terrestrials computers and they can go to any world they choose. Interlocutor: So this means that instead of moving in space ships they do it through those dimensional portals? Ruanel: Correct. It is something similar to what was made thousands of years ago in Egypt by the beings of Orion 3. Interlocutor: I understand. Is it possible to go to that place using also "worm holes"? Ruanel: If one had the technological capacity to travel 300 light years, yes. Interlocutor: But you said that the inhabitants of that world don't have that technology. Interlocutor: Do these dimensional doors have some relationship with worm holes? Ruanel: They have a similar composition and the physicists of that world take advantage of them. Interlocutor: What kind of technological advance do they have compared to our planet? A thousand years perhaps? Ruanel: No, it doesn’t have to do with advance, but rather they specialized on dimensional portals more than anything else. The planet Earth is one of the few worlds that advances equally in several things at the same time. It advances in quantum physics, genetics, philosophy, painting, music. Interlocutor: What is the name of that planet? I ask it to know if it appears in our astronomical charts. Ruanel: Its name is Cortex. Interlocutor: Just like the cerebral cortex? Ruanel: Yes, the same name. Interlocutor: Does it appear in our astronomical charts? Ruanel: Yes, it is in the Constellation of Virgo. One of the stars that belong to this Constellation is in fact Cortex which is approximately at 300 and 320 light years. Interlocutor: Was that dimensional portal through which the lieutenant Bello passed similar to the one that the scientists of Bellatrix used to abduct the Boeing which was going to hit the Pentagon? Ruanel: Yes, and it’s also similar to the portals made in Egypt by the beings of Orion 3. Interlocutor: I believe that everything is clear and if you consider it convenient, we’ll conclude here. This entry was posted at Wednesday, October 14, 2009 and is filed under Missing Persons . You can follow any responses to this entry through the .